Eng. 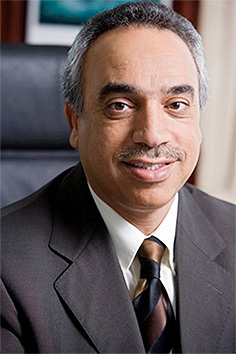 Essam Bin Abdullah Khalaf Minister of Works since 2010. From December 2014, he became Minister of Works, Municipality Affairs and Urban Planning. Bachelor of Civil Engineering from University of Texas in Austin, USA (1978). Master Degree in Transportation Planning from Virginia Polytechnic Institute and State University (1981). Diploma in Advance Management Administration from University of Bahrain with honors (1985). Has more than 35 years’ experience in all aspects of the engineering profession, he particularly supervised the development of sewage system infrastructure & other Strategic Projects in the kingdom. Eng. Essam Bin Abdullah Khalaf joined the Ministry of Works as an Engineer trainee on 1 November 1978. He worked as Engineer in traffic planning in 1981. He was the Head of the Department of Architecture and Planning (1986-1989), then the Director of Road Management (1992- 2002). Between 2002 and 2005 he served as Assistant Undersecretary for sewage system. In addition to his supervision since 2002, he headed the Coordination and Follow-up Committee, which coordinates the Ministry's projects with municipal councils until 2010. In 2011 he received Shaikh Isa bin Salman Order (Badge of Honor) of the fourth degree, and he received Bahrain Order (Badge of Honor) – First class in February 2011. The Interim Committee for Bahrain Building Code. The Commission on Rehabilitation of Tubli Bay. Eng. Essam bin Abdullah Khalaf was part of the planning teem of the Sheikh Isa Bin Salman Bridge (that links Al Busayteen and Diplomatic Area), and then Sheikh Khalifa Bin Salman Bridge (that links Al Hadd and Juffair) In the project of the fourth bridge. These projects were large projects that contributed to secure smooth movement between Muharraq and the capital and contributed to the reduction of traffic congestion going to and from the two cities. He participated in the development of the new strategy for sewage treatment, treated water use and the development of sewage system. He contributed in the development of the traffic model that complies with the 2030 vision of Kingdom by preparing the predictions reports of the traffic and transportation needs to prepare the strategic development plans for the road network to serve the infrastructure sectors. He contributed in the approval of the Ministry of Works and the Department of Construction and Maintenance Projects strategic plan.